Every six months the cast and crew of Knitting Daily TV arrive at Beachwood Studios in Ohio for a fast and furious week of taping an entire series of the show. Although it's a lot of fiber to cram into one week, along with all the work we notoriously balance in some good times. The first group dinner was at Taza's in Beachwood, Ohio, and we all split an array of Mezzas; from grape leaves and hummus to seasoned French fries. The restaurant was noisy, but I think our laughter took over-we had a great time catching up. Did you know that Kristin, Shay, and I all have ties to the Detroit area? And have planned get-togethers in Detroit for mac-and-cheese dinners and Kid Rock concerts? Start your color explorations with a getting started segment on stranded knitting with host Eunny Jang. Then, meet Laura Bryant and Barry Klein for tips on color blending – a technique that crocheters, knitters, spinners, and weavers can learn from. On this episode's Crochet Corner Kristin Omdahl and Shay Pendray join up to talk crochet edgings and trims, and Kristin demonstrates a reversible crocheted striped edging. Last up, Eunny gives quick tips for Armenian knitting, a colorwork technique for adding small patches of color into your knitwear. Kristin and Shay join forces on Crochet Corner to crochet reversible, striped edgings. Eunny begins this episode with great techniques for working with pencil rovings, and then joins up with fiber expert Deborah Robson to discuss why yarns tend to pill and how to prevent pilling for your favorite pieces. 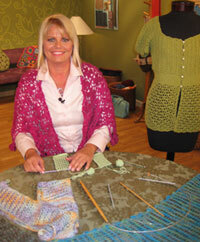 Shay and Kristin are up next with a faux overlapping crochet edging that incorporates great crocheted motifs. And finally, Eunny wraps up this episode with ways to use reinforced threads to save your garments from wear and tear. Here are some of the faux overlapping crocheted motifs you'll see on episode 806. This episode is all about the bag, purse, satchel, carry-all. Begin with a lesson on I-cord with Eunny and knit a cute clutch. Beth Gantz joins the set to talk embellishments and shows some great needlework techniques that can add a touch of whimsy to either handmade purses or store bought satchels. 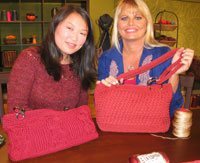 Then, Kristin joins Eunny on Crochet Corner to talk nylon thread and share an array of knitted and crocheted nylon purses – great for durability and sheen. Kristin demonstrates a unique crocheted cord that adds a stable strap to any purse and will last a lifetime. Eunny finishes this episode with a quick tip on mitered corners, great for shaping the bottom of a bag to give it more space to store your belongings. Eunny and Kristin show off nylon purses, one knit and one crocheted. Learn how to make the crocheted handle Kristin is showing here on episode 809. In my favorite episode of Series 800, Eunny begins with a technique for knitting Latvian braids. Then, armchair travel with Shay to Portugal and join Andrea Wong for a lesson in two-color Portuguese knitting. You can create a cute two-colored hat using this technique. 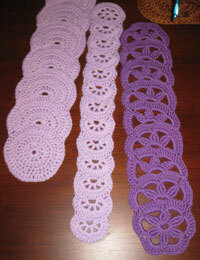 On this episode's Crochet Corner Kristin talks fine crochet with a lesson in Tunisian lace. And finally, Eunny finishes up with quick tips for thrummed knitting. Here Kristin demonstrates Tunisian lace, a crochet technique using a Tunisian hook that produces a great, airy lace fabric. Along with taping 13 episodes, we also found time to sample Hyde Park's appetizers, stop by Giant Eagle for milk and Oreos, and sincerely enjoy each other's company. We hope you'll tune into the newest season of Knitting Daily TV this upcoming January and learn about the needle arts and knit and crochet along with us. P.S. If you're interested in stocking your fiber studio with Knitting Daily TV DVDs, now's a great time to complete your collection. Now through October all KDTV 4-Disc DVDs are 3 for $99, including the current Series 700 now airing on Public Television.